I live in Iowa, zone 5, and my wife planted what she called a vine in the backyard last year. Photos to follow. It has come back this year, it has four strong stalks that emerge separately from the ground and each main stalk throws out a few lateral runs along the way. While it is placed near a wall, it isnt clinging or climbing. I don't believe it flowered last year, but this is the first full season in our garden, so I make no promises about what tricks it might have, but it doesnt look like it will. We both like this plant a lot and we're finally documenting what we have in a gardening binder. Any help identifying this fellow is greatly appreciated. My first time to this site... I'm afraid I'm going to be here a lot. Worse addictions, there are. Thanks again. I'm not certain but that looks like a variegated form of Polygonum cuspidatum aka Japanese Knotweed aka Mexican Bamboo aka "the highly invasive weed from hell". This sort of variegation usually substantially reduces the vigor of a plant but the straight species of this selection is a horrible and extremely difficult to eradicate weed. Even if it proves mild mannered it may produce seeds that revert to the straight species. If I received that "gift" from a neighbor for my response think Jack Nicholson in "The Shining" - "Here 's Johnny!" thanks so much for the reply. 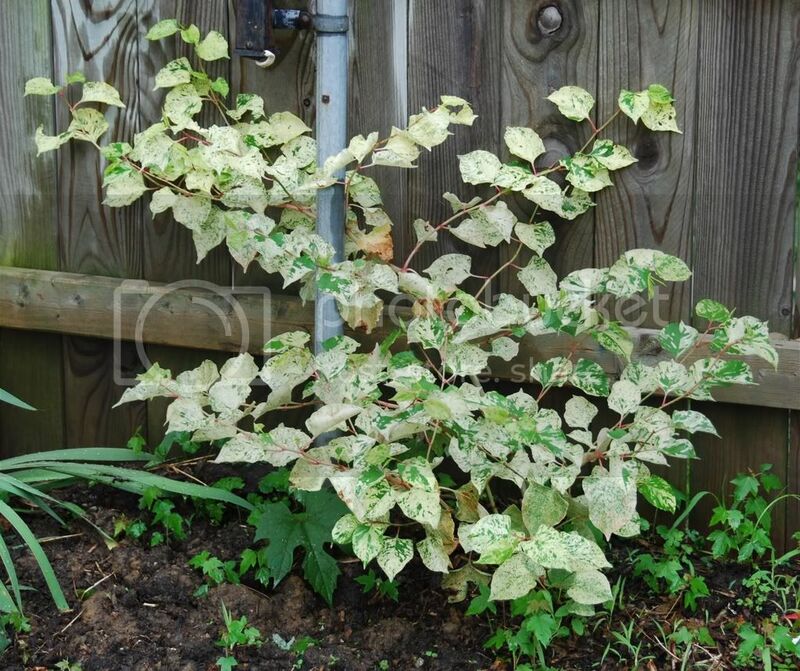 yahoo image search of variegated japanese knotweed gave me exact matches in look. perfect. just perfect. and i thought shed be pleased with my sleuthing. well luckily the fence it is against is still my property on the other side for at least 60 feet, so no axes needed (ala jack) just yet. =) im sure my beloved is going to make me "prove" itll ravage the garden before i get a chance to pull it by letting it have its shot... and only then will i get to rip it out. and then spend many more days chasing it. ive had an experience with an invasive bamboo "grass" that shot pencil thick rhisomes out three feet in just its first full season after planting... that was impressive and alarming. didnt want to hear what you had to tell me, but im grateful for the quick, accurate help. PS Birds and rodents can carry seeds much farther than 60 feet. MaineDesigner wrote: PS Birds and rodents can carry seeds much farther than 60 feet. i know... i know... and thanks again. ive already started the "we need to dig it out" campaign. its going to be an ugly battle. yuk. and yuk. I was just wondering where your wife actually got the plant from? Cgardener, good luck talking to your wife. Show her web sites of how invasive that plant can be - especially how difficult it is to get rid of. If she's too resistant, you might want to get rid of the plant and tell her you accidently chopped it with the hedge trimmers. Or tell her you saw a virus on it that would spread to other nearby plants. Or replace it with another plant, keep her away from that area until it grows enough to say, "Look what must have been more aggressive than that other one." not sure where the plant was from... we've frequented big box stores and well known garden centers as well as local, private nurseries , FFA sales and the come-and-pick-anything-out-of-my-garden-to-split-for-5-bucks places. she brought it home i believe after a saturday morning out with a friend... they go places, buy plants, and program my saturday afternoon. usually it works out pretty well. i have a hunch of where she might have picked it up and plan on visiting this weekend to snoop. so... yes, i have the pics of the straight form, a list of the states that ban it, a folder of links for her to scour, and she understands enough about genetics and hybridization that it wont be an issue about facts... itll be an issue about liking that plant and my convincing her that the villagers will come looking for frankenstein. were it in the pot on a shelf in a store, shed walk away from it. now that its in her ground and has behaved so far, itll be an emotional struggle. kp2171 wrote: were it in the pot on a shelf in a store, shed walk away from it. now that its in her ground and has behaved so far, itll be an emotional struggle. When I lived in Atlanta (and visited Washington, DC, Colonial Williamsburg, North Carolina, and similar locales), English Ivy was a beautiful, elegant vine. I moved to the San Francisco Bay Area. A couple of years later, I met my now-husband and moved into his house. The north fence (all of 8 or so feet from the house itself) was covered in--yep--English Ivy. "Oh, how beautiful," was my initial thought in January. By March or April, that thought had changed to, "Oh my Lord, I had no idea that that stuff could grow so FAST!" which was soon followed by, "Do you know how to cut this stuff back?" and then, in July or so, "We need to buy MORE YARD BAGS!" The English Ivy I had known and loved from a (very short) distance in the Southeast had turned into...KUDZU. And the War against the Ivy was on. It continued until 1997, when we sold that house and moved to this one. Betrayed by this beautiful plant, I had no mercy and was frustrated that I had to leave some ivy on the fence to hold the stupid fence up! The ivy had both grown into and through the fence as well as using its suckers to weaken the (wooden) fence. So you can always hope for *this* type of reaction when she realizes she has given love, comfort, and SPACE to...a hostile invader. I've had the chance to dig stuff out of someone's yard recently. I passed it up because the things I wanted were too big up. I thought I'd end up doing all that work and it would not survive the transplant. Sounds like you and your wife have really been bitten by the gardening bug. It will be much more rewarding now that you are combining experience with research. One of the things I appreciate the most about the internet is the amount of knowledge I can acquire without getting out of bed and still in my pajamas. It helps make the gardening much more rewarding to add to that the gardeners I've come to know. No matter how this works out with this one plant, you will be able to really experience the positive benefits having each other to share it with. Remember, it is one plant. If you can't stress anything else, stress that it is one plant that can have negative effects on a lot of the time and energy you have expended. And the many plants you already have to enjoy and will enjoy. when she gets back from her trip and sees all of this she might also tell me to torch it. shes a smart, decisive woman who can pull the trigger on a plant that doesnt please her. thankfully shes been more patient with her betrothed. 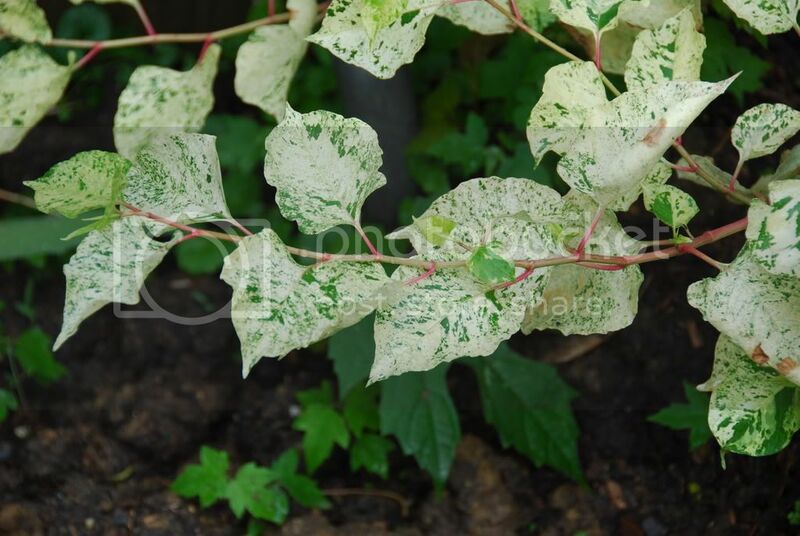 a last update... since where the variegated knotweed came from was an unanswered question. she apparently received a piece of the plant from a woman who has had it in her garden for several years without incident. my wife visits this garden probably twice a year and brings things home. im going to see if i can get her to take me to see the long established plant and talk to her about it.